Let’s grow carrot tops! One of the easiest plants for a young gardener to grow, carrot tops make pretty houseplants for a sunny window and their fern-like foliage is beautiful in an outdoor container garden. Eventually, white lacy flowers will bloom. Growing carrot tops from carrots takes no special equipment and results will be seen in a matter of days – always a bonus when working with kids! First off, a word of caution; when we say you can grow carrots from carrots, we mean the plant, not the root vegetable. The orange, kid-friendly vegetable is actually a taproot and once removed from the plant, it can’t regrow. Make sure you explain this to your kids before your project begins. Otherwise, if someone thinks they’re growing real carrots from carrot tops, they’re likely to be disappointed. 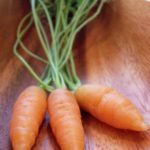 There are three different ways to grow carrot tops from carrots. All have a high success rate and all are fun for kids. You can grow carrots in water. Cut the top from a grocery store carrot. You’ll need about one inch of the root. Stick a toothpick into either side of the carrot stump and balance it on top of a small glass. Use an old juice glass for this since you’ll probably end up with mineral stains. Fill the glass with water up to and barely touching the bottom edge of the stump. Set the glass in a light, but not sunny window. Add water to keep it touching the edge and watch the roots sprout. You’re growing carrots from carrots in a glass! The next method to grow carrot tops from carrots involves a glass or ceramic pie plate and marbles. Fill the plate with a single layer of marbles and set the one-inch stubs of the veggie right on top. You’re still going to grow carrots in water, but the level is determined by the tops of the marbles. It’s easier for kids to judge. You can sprout six or seven stumps when sprouting carrot tops this way. When planted together in a single pot, they’ll make a spectacular display. Lastly, you can us any type of plate and several layers of newspaper for sprouting carrot tops. Lay the newspaper on the bottom of the plate and soak the newspaper well. There should be no standing water. Set your pieces of carrot tops on the papers, and in a few days, you’ll see the roots spread. Keep the paper wet. Once the new plants have rooted well, your kids can plant them in soil. The new plants should show growth pretty quickly and your lucky little gardeners will be delighted with their reward.